Some customers loved that the Nike Air Force 1 07 LV8 JDI runs true to size. Several users praised the remarkable amount of arch support that the sneaker delivered. The high-quality materials used in its construction was also commended by a lot of buyers. Many wearers were highly satisfied with the comfort and cushioning of these AF 1’s. Aside from having a cozy feel, some of the consumers even appreciated the durability of the silhouette. The sneaker adds an elevated appeal, according to one purchaser. One reviewer was astounded with the sneaker’s design which blends well with almost any article of clothing he chooses. The Nike Air Force 1 07 LV8 JDI only comes in limited colorway options. One user disliked the chunky look of these AF 1s which makes his feet look more prominent. Honoring the 30th anniversary of the “Just Do It” logo statement, the global brand introduces the world to yet another timeless design called the Nike Air Force 1 07 LV8 JDI. The low top sneaker exudes its supreme inclination with the 1988-born slogan and covers its tonal black upper with it. The design is not only the creme de la creme element of the sneaker but comfort and durability also. With a limited amount of colorways, AF 1 fans would surely want to cop a pair of these Nike exclusives. During the time where the first test tube baby was born, Nike was inoculating an almost intriguing technology that would marvel millions in the decades to come. The Nike Air Tailwind debuted its first appearance in 1978 at the Honolulu Marathon in Hawaii. A year after the test market had tried on the shoes, Nike released it to the public. From there, the Air-Sole unit sparked a lot of interests and reinvented the way the footwear cushioning system works. The encapsulated air in a lightweight Phylon midsole became the go-to tooling for the Oregon brand that had even used it in a platoon of sports-specific footwear. One of which is the Air Force 1, a name that takes a nod to the presidential plane. Its high flying antics in the basketball court deemed it reasonable during its early years but soon faded when fashion overtook the lifestyle floor. Though it was discontinued in 1984, the sneaker stayed relevant thanks to several loyalists like Nelly who even made a song about them. The time where vintage apparel was revived and had dominated the streets became the needed boost for the sneaker to again roam the surface like a wild lion looking for unaware prey. With this gift of versatility, the sneaker had been revamped a million times to cater to every hungry consumer’s desires. The year 2018 is the 30th anniversary of Nike’s coveted “Just Do It” mantra which was pulled off from Gary Gilmore’s last words. It was only adequate for the Oregon brand to splatter several of its silhouettes with the famous slogan one of which is the Nike Air Force 1 07 LV8. This shoe, also called the Nike Air Force 1 07 LV8 JDI trainer by some retailers, contains an upper thoroughly drenched with the Just Do It detailing. Little white marks of the “Just Do It” statements are arranged arbitrarily covering the full black tone of the upper. The same design also includes the subliminal Swoosh. The mosaic-ish design of the Nike Air Force 1 07 LV8 Just Do It in black collates all imagery into one fine-spanking silhouette built for the streets. The best apparel to further showcase the avant-garde low top is light colored pants or denim which are folded on the bottom. Joggers and shorts would also suffice. The commemorative sneaker generally fits true to size. Black laces allow full snugging up to the front of the shin. Men can cop a pair of these flaming kicks in sizes ranging from 4 to 18 which are all constructed in D medium width. Women would just have to go 1.5 sizes down their regular shoe size if they want one. From a distance, the Nike Air Force 1 07 LV8 JDI seems to have a static design but looking closely to each detail will unravel numerous “Just Do It” markings with tiny orange Nike Swooshes. The white-outlined Swoosh on the side panels also bears the same concept. These busy uppers all sit on top of a white stitched sole for an “elevated” style. The rubber sole displays pivot points for traction and quick movements along the court. The coveted encapsulated Air-Sole unit provides lightweight cushioning. Its upper is made of leather while the interior is made of textile. 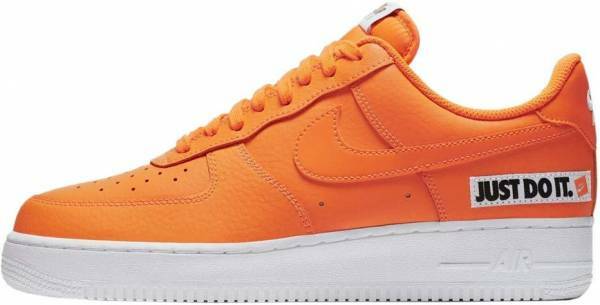 The Nike Air Force 1 07 LV8 JDI casual shoes retail at $100.